As ABC 7 Chicago's Food Reporter, Steve Dolinsky reports as The Hungry Hound on ABC 7 Eyewitness News. His reports air Fridays on the station's 11 AM newscast and Saturdays on the 10 PM newscast. 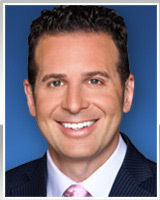 Dolinsky joined ABC 7 in October 2003. Dolinsky has garnered 13 prestigious James Beard Awards for his TV and radio work over the past two decades, including seven for TV, five for radio and one for podcast. Dolinsky has been a food reporter for WBEZ-FM, Chicago's public radio station, a food correspondent for "The World" on Public Radio International, and has written articles about food and restaurants which have appeared in the Chicago Tribune, the Chicago Reader and Canada's Globe and Mail. He's was chosen to be a judge on the Food Network's "Iron Chef America," presiding over Battles Rabbit and Pheasant. In 2018, Dolinsky's first book, Pizza City USA: 101 Reasons Why Chicago is America's Greatest Pizza Town was published by Northwestern University Press. He visited 185 restaurants in the region to settle on his 101, which includes 10 styles of pizza in the city and suburbs. This led to the creation of Pizza City USA Tours, a weekly tour business, sampling four different styles of pizza at various locations in about three hours. The company offers both coach tours as well as neighborhood walking tours. Previously, Dolinsky was the Executive Producer and Host of "Good Eating" on CLTV, the 24-hour news channel owned by the Tribune Co. The weekly half-hour show featured chefs, health news, wine reviews and inexpensive restaurants around Chicago. Dolinsky hosted that program from 1995-2003. An advocate for the local chapters of Meals on Wheels and Share Our Strength, Dolinsky volunteers his time to help promote their causes. He has a Bachelor of Arts degree in Journalism and History from the University of Wisconsin - Madison. He previously worked as a general assignment news reporter in Michigan (WLUC-Marquette), then the Quad Cities (WHBF-Rock Island, IL; KWQC-Davenport, IA), and finally, for two years at CLTV, before joining the "Good Eating" team. Watching Julia Momose work behind the bar at Kumiko, which maintains a sign-less existence at the northeast corner of Lake Street and Des Plaines, is like watching Yo Yo Ma play the cello. The Milwaukee Bucks have a new arena with a new food service program. It's so good, it's beginning to draw fans from the North Shore. Vajra isn't like any of the Indian restaurants on Devon Avenue. The restaurant offers both Nepalese and Indian fare - a rarity in West Town. "We are trying to introduce a new type of modern Indian cuisine, upscale restaurant, which will serve the traditional food." The country of Myannmar, formerly known as Burma, is barely understood in the U.S. Even less so is its cuisine, since there are only two Burmese restaurants in the state. The husband and wife owners used to live in Italy - Salerno, to be exact - and they missed making pizzas in their family's garage oven.